A little putt-putt ferry took us from Glengariff in West Cork across Bantry Bay to see the Garinish Island garden by Edwardian landscape architect Harold Peto. Despite the drenching rain, I was excited. A Peto garden! But whether it was the quality of light on a showery day, the effect of my polarizing filter or the suddenly wonky 18-55 lens on my battered Nikon D40, all the shots from our visit seem oddly hued and hazy. Some look like the hand-coloured photographs popular around the time this garden was created in the first quarter of the last century. 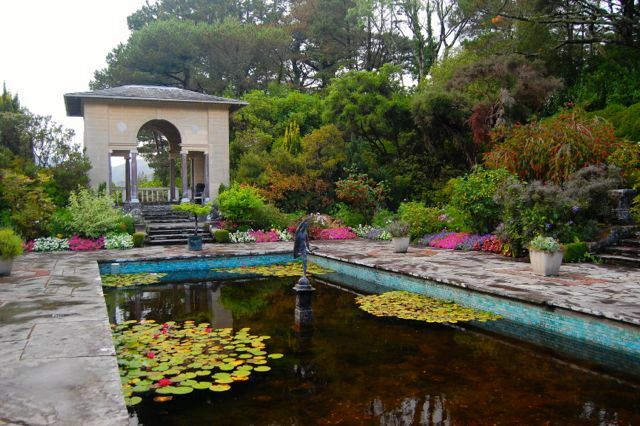 That’s all I have going for me, really, as these are the same views you’ll see over and over in pictures of this lovely island garden – because Peto designed it that way. It’s impossible to find a view that isn’t highly photogenic – and, therefore, highly photographed. The plantings might be slightly down at the heel, despite being dotted with rare species, but his bone structure is pure gentry. 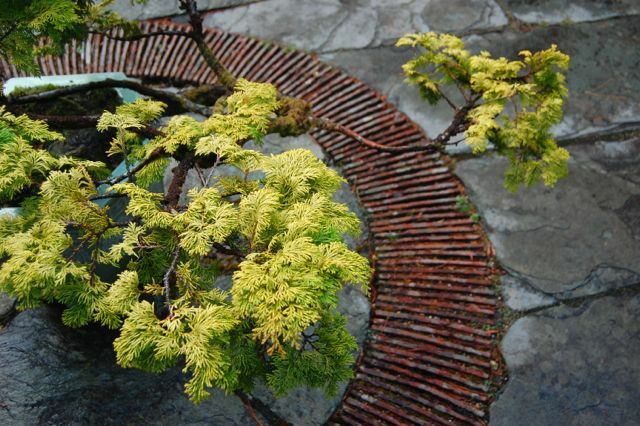 Enjoy this little piece of garden design history. And if you’re interested in more, check out this blog devoted to Garinish Island. 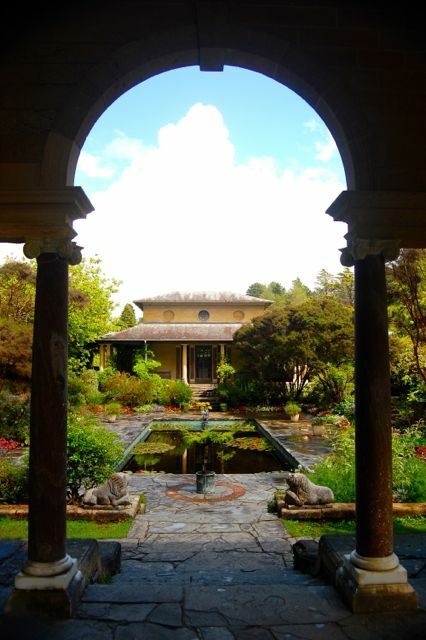 An architect before he turned to landscapes, Peto was a major proponent of Italianate garden style. 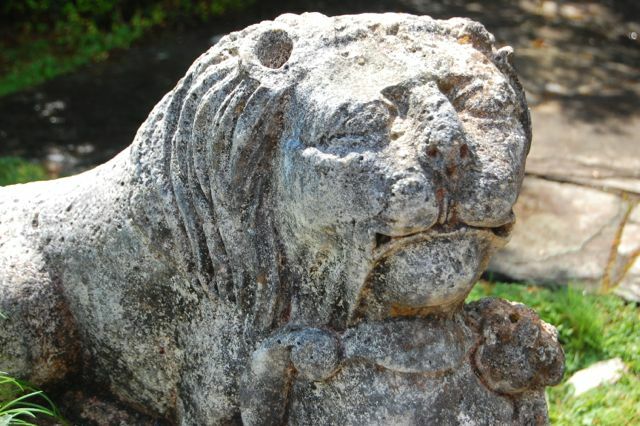 Weathered but wonderful lions are sadly succumbing to frost damage. The view of the Casita or Teahouse from the Pavilion. Step through the portico for a wider view. The Walled Garden, with its 17th-century gates. 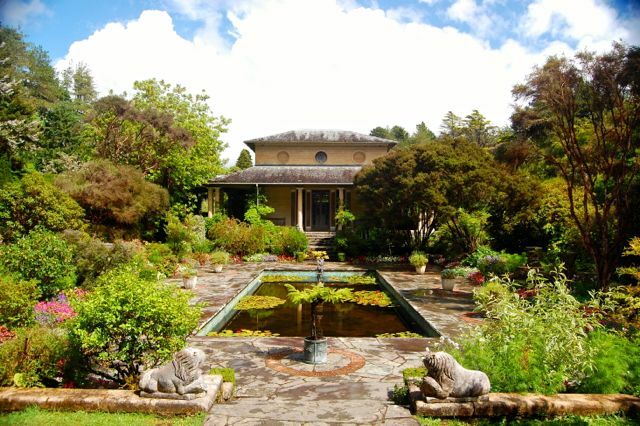 Want to visit more Irish gardens? 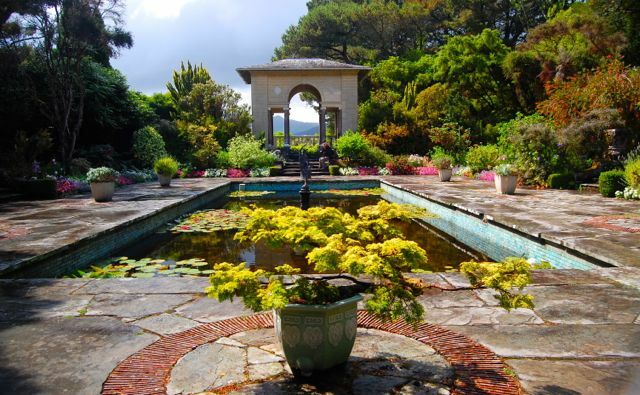 Wonderful to see these photos and to read about a Peto garden. I'm curious, though, about the framing of the borrowed view. It is centered on the space between the two mountain peaks rather than on the peak itself. Was there something in the topography that dictated this choice? Would framing one peak put the other in a disadvantageous position? Or would Peto have thought that framing the peak rather than the space was too obvious? I'd welcome your thoughts on this. Looks like a lovely place. Such lush borders! I was wondering the same thing about the borrowed view, though. Wonderful! Thanks so much for sharing these photos and highlights of your visit. Pat, you ask an interesting question. I have no knowledge of what Peto's thinking was. However, if I had to come up with an idea, I'd suggest that framing the view that way piques curiosity. Rather than framing the view so it can be enjoyed from a distance, both the Temple and the Pavilion draw the viewer forward by offering only a tiny window on the valley where the two mountains meet. As you come closer to the ideal view, which must be from right inside, you see the grandeur of nature — and it makes the works of civilization feel small by comparison. 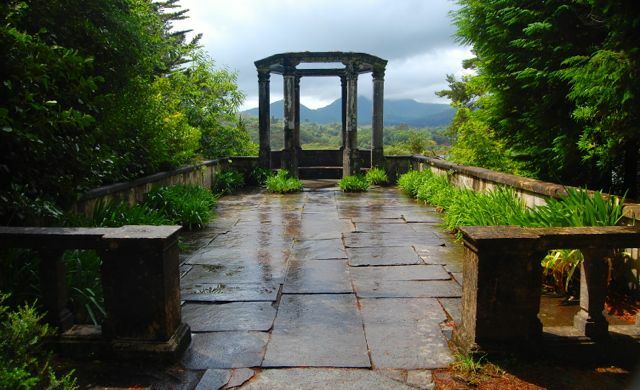 But Peto's garden is like a poem in space and form and, like any poem, invites subjective interpretation. Why do *you* think he did it? I like your explanation, Helen. Anything in a garden that piques curiosity and makes you ask yourself questions is good, in my view. Simply the act of walking into the space adds another dimension and another experience. If the 'trick' appears in other places in the garden, I think we can be sure it was deliberate. Thanks for the idea and the response. Oh, MY … the walled garden is incredible. Thank you for sharing! So glad that I took the time to sit down and start going through my 'reader' – work has slowed, and I was enthralled to stumble across this post! 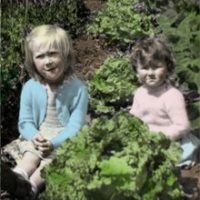 While I am not familiar with Peto, I have always believed that Ireland is where gardeners go when they leap tis mortal coil! This is truly sublime! 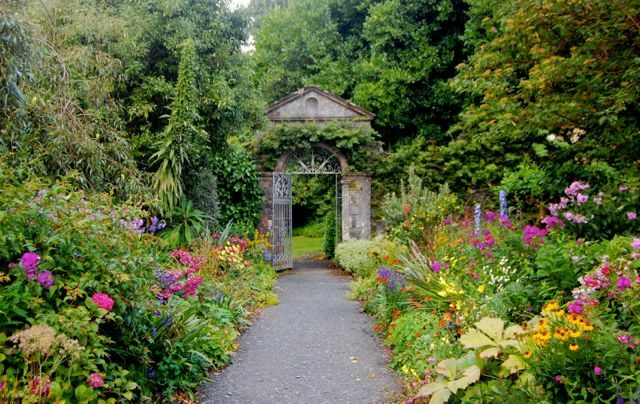 Any chance you made it to Jimmy Blake's garden while you were on the Emerald Isle? Glad you found it, Barry. 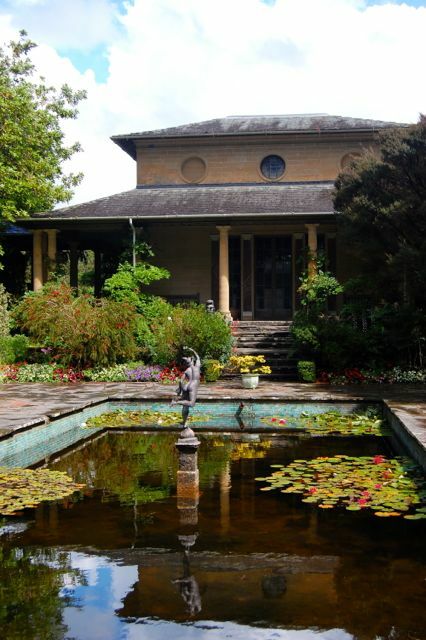 But as for Jimi Blake's garden, not yet, unfortunately — hoping we're able to fit in a couple of gardens when we swing back to Dublin, and Huntingbrook was on my wish list. It's nearby, and thanks to your recommendation I'll whine a little louder about visiting. Sláinte! Mirror, mirror on the wall… or is it ball?